Travel Essentials From “The Urby” !! Today I’m Talking About One Random Fact About Me . & Travelling Should Never be done without an Amazing Travel Essentials.. ?? Going For An Outings Is My Passion. N what one thing which is must have For all We Sunshines while traveling is “A Cute Slim Wallet ” to carry all Our Important Cards/ Money/other Slim Documents ..
Now The Question In Our Mind , From Where To Buy All These Stuff ?? ?? Don’t Worry , I Have One Stop Destination To Share With you all . Which Can Cover All Your Needs. Today Im Introducing A Smartest Way To Shop All Our Travel Essentials and other lifestyle products. The Brand Popularly Known as “The Urby” Lifestyle ! Buy Luxe Lifestyle Essentials From “The Urby ” At Super Affordable Revolutionary Prices. At Urby, they design & manufacture essentials for an urban lifestyle using the most premium materials and finest craftsmanship. By selling directly to you, they eliminate the middlemen; thus offering high quality products at non-luxury prices. The Brand Sent Me The Two Lifestyle Products Which Comes In a Super Cute Black Coloured Box with brand’s name printed on it. Each Product Was so beautifully Packed Inside these Cute Canvas Drawstring Pouches ! So Let’s Talk About Both The Products One By One ! Aww, Look At This Pretty Chic Dark Pink Colour Magnetic Wallet . I’m In Love With It. My Name Is Written at the bottom With Golden Foil . I Love this Wallet alot , Being Personalised In Nature Is like cherry on the top for me. It Comes In Many Other Colours also . You can check The Whole Collection Here . MATERIAL : Premium Quality Real Leather . Designed for a perfect blend of efficient functionality & sophisticated style, the classy money clip card wallet takes away the features that a minimalist won’t need. This is an Elegant Firm Key Chain. 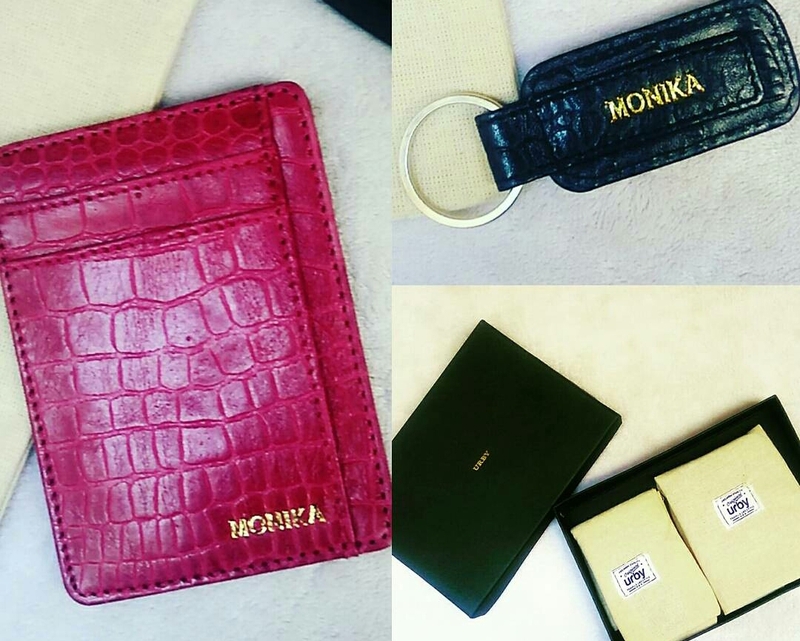 It is made Up of Premium leather & I received in Colour Classic Black ! The royce key chain is designed to exude elegance combined with quality. It is made to comfortably hold all your keys with its firm metal ring while still looking great. Elegantly tailored to the last stitch, the royce key chain is crafted in our finest grained leather. With tamper-resistant security screw guard, the key chain is made to serve your keys timelessly. Priced at Rs. 395/- + Rs. 150/- Extra For Personalisation ! Then Hop in Now At “The Urby ” Official Website ( Find The Direct Link Below ⬇⬇⬇ ) & Buy Some High Quality Lifestyle Essentials At Super Affordable Revolutionary Prices. (((( Urby is a direct-to-consumer, lifestyle and travel accessories brand . They design and manufacture essentials for an urban lifestyle using the most premium materials and finest craftsmanship. Do Visit The Links , I’m Sure You’ll all Fall in Love With The Collection & Will definitely Thank Me Later ?? So Do Like & Share your thoughts In The comment Box Below . Have a Joyful Sunday Ahead !! Keep Shining & Keep Visiting My Blog.. I love anything personalised. Will check them and place an order soon. Do they also do passport covers that are personalised? Thanks alot. Dear. Yeah. They got amazing range of passports holders. Do follow the links. Just love to have personalised things. That Charlie wallet looks too gorgeous and of high quality. Specially like the gorgeous shade of wallet and golden name written on it. Loved the classy wallet and the personalisation. Have marked it for my next purchase. We need these in our list when heading out. So many cards to carry and so little space ( we always feel short of space no matter how big our purse is..:-)) the pink wallet is just perfect to add some extra girly touch to our belongings. Nice post , personalizing travel products is a good idea, will check the store. I just love personalised stuff. Love the quality of this brand. Will definitely check out their other collection. I like the design and the look. Such a useful product. I really like the idea of customised travel accessories and loved the red/marron wallet a lot. I loved the colour of the wallet. Will look into this brand. Loved the wallet. Will definitely check this out. Thanks for an honest review. I love personalized stuff! These travel essentials look awesome. Oh I love the customized accessories. They look so good and stylish. Wish to have one such set for self too.